There's no point in keeping a stash of emergency flashlights around your home if the batteries inside them just end up getting stolen for TV remotes and the kids' toys. 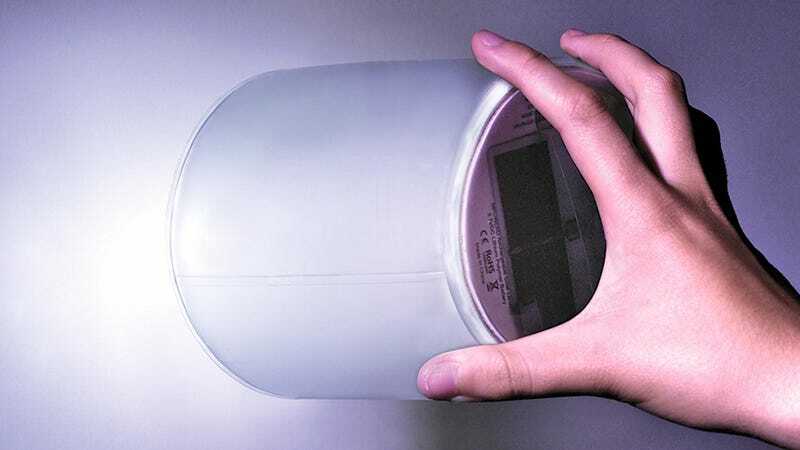 So the folks who created the original LUCI, a dirt-cheap inflatable solar-powered rechargeable lantern, have tweaked its design for the new Luci EMRG so that it produces a more intense focused beam and can now double as an emergency flashlight. The previous versions of the Luci provided a soft diffuse glow from a set of multi-color LEDs in the lantern's base, but sometimes you need to be able to shine a light farther than just a few feet past where you're standing. So the Luci EMRG uses four new LEDs that shine extra bright to project a flashlight-like beam. To maximize battery life there's also a mode where the LEDs glow softer and more like the original Luci, but it's nice to know you can turn things up a notch when needed.